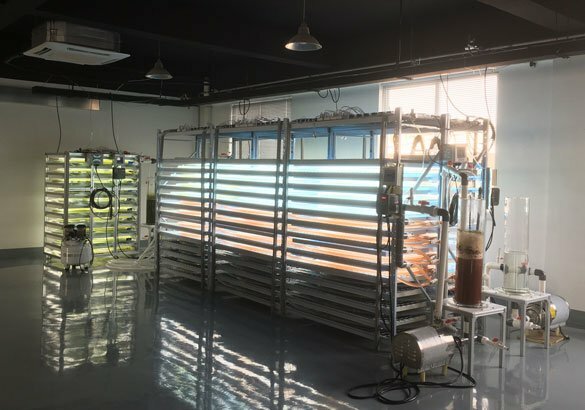 Morgan Hill’s photobioreactor was recently evaluated by AzCATI in Arizona State University and proved to be able to achieve over 100 g/m2/day on Scenedesmus, Chlorella, Nannochloropsis, and Synechocystis. organ Hill BioEnergy, Inc. has introduced their proprietary algae photobioreactors, the 100L and 200L, developed for commercial cultivation of highly pure algae biomass ideally for the nutraceutical and pharmaceutical industries. The company, founded in 2013 in San Jose, California, also focuses on bioenergy and the health products sectors. They are working on projects to use algae to produce hydrogen and human therapeutic protein. Their nutraceutical and cosmetic products based on astaxanthin currently sell on Amazon. Their company has two subsidiaries in Shanghai and Suzhou China with 5000L production lines based on their proprietary PBR. AzCATI serves as a research and learning environment to help accelerate the research and development of algae-based technologies. AzCATI had the opportunity to test and validate Morgan Hill’s new tubular 100 L photobioreactor. This PBR is a closed-system fabricated with all food grade materials and a footprint <1 m2. AzCATI investigated claims of increased microalgae productivity with concurrent high-stress induced co-product yields in batch cultures. The results from batch trials conducted with Chlorella vulgaris, Scenedesmus acutus, Nannochloropsis oceanica and Synechocystis sp. are reported below. Dr. Thomas A. Dempster, ATP3 Testbed Site Coordinator at AxCATI, was lead on the testing process for the PBR. “When I was initially told that the MHB PBR permitted rapid microalgae growth while concurrently promoting an increase in stress products, I responded that I would have to test it to believe it,” he said. “After conducting multiple validation trials with several different strains, we did in fact observe high productivity coupled with high oil and/or astaxanthin concentrations in short batch trials at AzCATI. Microalgae productivity remains a significant hurdle for commercial entities to develop and commercialize profitable products. Open raceway ponds typically produce microalgae at a rate of 0.03-0.1 g/L/day (5-15 g/ m2/day) depending on the strain and season. Typical vertical flat panels and some closed tubular systems have productivities that range from 0.05-0.5 g/L/day depending on the strain and the PBR light path. The MHB PBR outperformed traditional 2-inch – 15 L vertical flat panels almost 2 to 1. Volumetric productivity for Scenedesmus acutus and Chlorella zofingiensis averaged >0.5 g/L/day. During the Scenedesmus acutus and Chlorella zofingiensis batch runs, maximum aerial productivity (footprint) exceeded 111 g/ m2/day and sustained aerial productivity averaged 59 and 62 g/ m2/day, respectively. Synechocystis sp. (PCC_6803) culture density was 4 times higher in MHB PBRs than traditional flat panels after 7 days of growth. The MHB PBRs exhibited an unusual ability to rapidly produce microalgae biomass while simultaneously generating high stress-induced co-product (total FAMES and carotenoids) yields during short batch runs.